So unfortunately DC||ED has just decided to mangle my scene2. However, although the file can no longer be read with anything, I have found that a lot of data is actually still intact in the hex. Does anyone know if position/rotation data can be salvaged using a hex editor? I've retrieved several scripts already, so I was wondering if object positions, etc are possible. 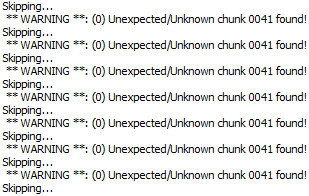 If it helps anyone, here are two errors I get when trying to open the mission in different tools. The first is from DNC Extractor and the second is from MWE. You can PM me your scene2.bin so I can have a look if you want.